A brand new disturbance rubber based on anti-looping technology, JOOLA Timeless enables excellent control without extended training and provides impressive ball feedback. 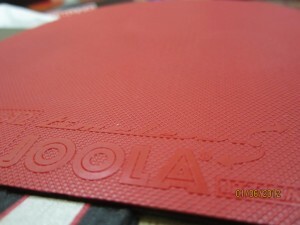 In addition, as the slowest one of JOOLA’s rubber assortment, this particular rubber utilizes many un-automated processes to give it that special touch. In particular, the rubber surface is composed of a completely new structure, achieved through the use of a revolutionary production technique, where the rubber is ‘chemically burned’. Together with a foamed layer of sponge, the top-sheet is able to create spin reversal and speed variations that can be controlled by any player. As a result, Timeless is especially unique for special material players. Pavel Solja, the successful coach who is responsible for training one of the most successful European special material players, Amelie Solja, describes JOOLA Timeless as a milestone in development of rubbers with spin reversal effect! I finally got the chance it for a few days. 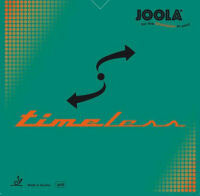 This joola timeless antispin rubber has been provided by Joola Germany through greenpaddle.com. Like Haggisv said, it was really a challenge testing this rubber because im not an anti spin user though i can use it properl;y its unlike any other anti spin i have used before. I have used the Yasaka Anti Power, RITC 804 and Butterfly Super Anti spin before and these will be the anti spins im gonna use for comparison. The sponge is the mushiest sponge for a table tennis rubber i have tried. Its as soft as a dish-washing sponge, very light at 34 grams uncut due to less density. the topsheet is surprisingly hard. a typical topsheet has a pimple structure that deforms when you are pressing the topsheet, the joola timeless topsheet is a bit hard and resists deforming. i will explain later the effects of this design as i go further. also the rubber as a whole is slower in returning to its original form when you press your fingers against it indicating again it has a very very soft sponge. It has a way, way softer sponge than the 804, antipower and super anti. The topsheet with its crisscross design or x like individual design (i cant think of any other description) at first look seems like a pure gimmick but upon testing and playing against it gave me a different judgement. The Timeless has a slight grip. Not as grippy RITC 804 antispin but grippier than the Yasaka Anti Power or Butterfly Super Anti. Chopping – one of the 2 main strengths of the timeless. i only know basic chopping in the backhand and can only return 2-3 successive loops in a row so i opted to let good choppers use the timeless. the first one who is my fellow coach, who is more like a 2300 US rated player, and is a well known chopper tried chopping it while being glued to an off- blade and because of the ultra slow speed of the timeless can chop looped balls well with it. It chops like an LP, low spinny chops against topspin. other players who have tried this are like 1700-1900 equivalent players and they had fun using it against players who said that has a unique effect on the ball. you need to really press on the ball towards the sponge to chop better. due to its very slow speed light brushes away from the table when chopping goes to the net. deception and variation – deception is very high. from knuckle balls to high underspin balls when chopping or blocking. the timeless antispin even has a wobble effect on the ball. maybe this is the purpose of the crisscross design weave pattern on the topsheet that it gives good variation towards incoming spin. against lower level intermediate players, this would be hard to play against with. 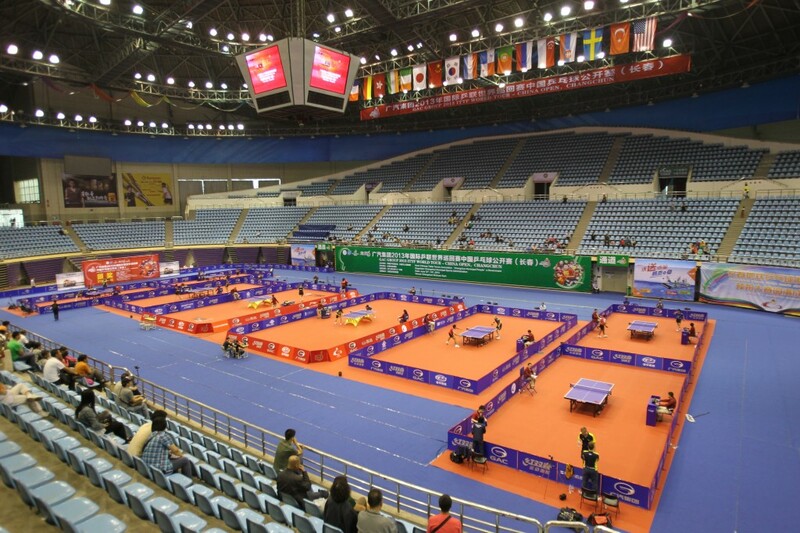 dropshots – due to its very slow speed, dropshots are a way in the park. 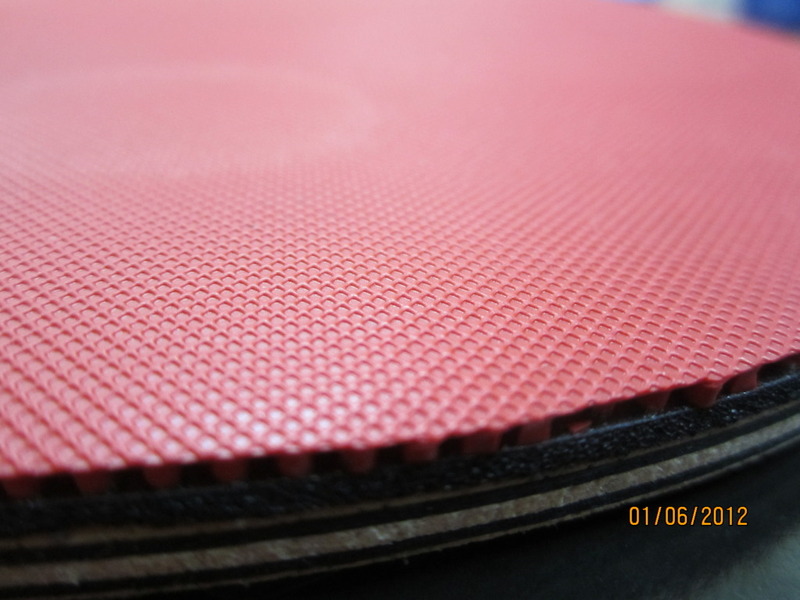 the hard topsheet absorbs the force on the ball coupled with the very soft sponge makes the dropsheet very controllable. blocking – both a good and bad characteristic of the rubber. 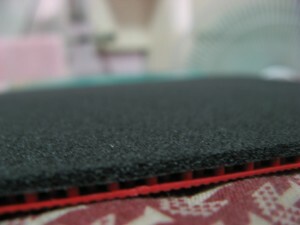 its good because as what i have stated previously the hard pimples on the topsheet and the soft sponge make hard topspins easier to block. the varied effects of knuckle and diff. levels of underspin helps it very difficult to play against. price – let me be honest here. at 125 USD this is the most expensive rubber in the world and 70% of people who play table tennis cannot afford this rubber. Joola explained to me that it is due to the amount they have spent on making the rubber mold and i believe them. I saw an episode one time in the national geographic channel’s megafactories: lego, that everytime they come up with a new concept on their designs they use existing metal molds for their plastic parts to produce them. each metal mold when made costs hundreds of thousands of euros. the design on the topsheet playing surface i think makes it difficult to make into a mold. fragility of the sponge – as what others have said you need choose a good blade for this or dare suffer of sponge damage when you remove it and transfer it to another blade. im using the yasaka galaxya and its an off- blade. so far so good. Other people have suggested to use a stiffer blade and I agree because it makes passive blocks a lil faster. If you dont transfer the rubber to another blade then i think this rubber will last for some time though i need to wait and see first. blocking – its both a good and a bad side of this rubber. i have difficulty with passive blocks due to the softness of the sponge and the ball returns really slow. also you have to make the bat angle a lil more open on medium power shots. its hard to do blocking with a 60-70 degree angle because it goes to the net. the solution as i have found out was to push block instead of just a passive block. Against stronger shots blocking is not a problem. Away, from the table its best at chopping. blocking with it is a bit difficult. Its too slow that instead of blocking mid distance from the table, you need to hit the ball hard for it to return properly over the net. not for beginners – i think a player who is rated at least 1700 should use this only in order to fully utilize its strength and cover its weaknesses. it takes a bit of time and skill to adjust and having the right blade angle when using this. A radical design and a mix of effects on an anti spin rubber. if not for its hefty price a lot of people would buy this because its a very good anti spin rubber. if you will ask me if its worth it ill just say if i have the money why not! rated as 8/10 for its performance but 6/10 for its price. For further reading and duscussion on this rubber, you can also check out the huge discussion on the Joola Timeless at OOAK Forum.